DaVita Healthcare Partners is one of the leading kidney care companies in the United States. The company provides dialysis services to approximately 185,000 patients with chronic kidney failure and end stage renal disease (ESRD) through a network of 2,293 outpatient dialysis centers located in 46 states and the District of Columbia. DaVita also provides inpatient dialysis services in approximately 900 hospitals along with related laboratory services. In 2012, DaVita acquired Healthcare Partners (HCP) for $4.7 billion. HCP is an integrated healthcare delivery and management company serving over 800,000 patients. The health care industry, broadly defined, has a number of peculiar characteristics due to heavy government involvement from a regulatory and payment perspective. In the case of DaVita’s kidney care business, government policy plays a particularly important role. Patients with ESRD who are either waiting for a kidney transplant or are too sick to qualify for transplant must undergo dialysis treatment three times per week to avoid uremic poisoning that will typically result in death within a short period of time. Dialysis treatments are non-discretionary and recurring in nature. The service is highly regulated and dominated by patients receiving government benefits. In this article, we take a high level look at kidney failure statistics to understand the size of the population requiring treatment. We then look at the dialysis industry with an emphasis on the characteristics that make it unique within the broader health care industry. This is followed by an examination of DaVita’s kidney care business along with a more basic overview of the HCP business. There are a number of risks associated with DaVita’s businesses which we will attempt to analyze followed by some thoughts on the company’s current market valuation. 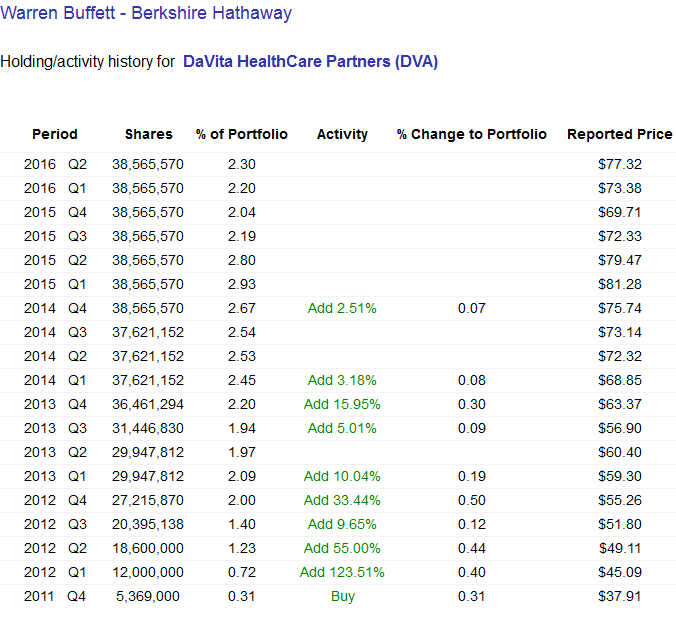 Finally, Berkshire Hathaway is a major investor in DaVita. Is there a chance that Berkshire might increase its stake in DaVita after recent weakness in the share price or potentially acquire the company in a friendly transaction? According to the National Kidney Foundation, more than 660,000 Americans are currently receiving treatment for kidney failure, which is also known as end stage renal disease (ESRD). Diabetes is a major risk factor associated with kidney disease. More than 29 million people in the United States have diabetes and approximately 25 percent are unaware of their condition. Additionally, 86 million adults have pre-diabetes, and 15 to 30 percent of these people will develop diabetes within five years. In addition to diabetes, certain races are more likely to experience kidney failure. High blood pressure is also a common cause of kidney failure. Since kidney disease often lacks symptoms until late stages, those who are affected may not become aware of their condition until the need for life-saving treatment is imminent. Of the 660,000 Americans with kidney failure, 468,000 are dialysis patients and the rest have received a functioning kidney transplant. As of early 2016, there were 100,791 patients awaiting kidney transplants. The median wait time for an individual’s first kidney transplant is 3.6 years. In 2014, 4,761 patients died while waiting for a kidney transplant while 3,668 people became too sick to qualify for a transplant. As we can infer based on these figures, there are a large number of patients who are on dialysis but are not candidates for kidney transplants. Approximately 39 percent of kidney failure patients are 65 years of age or older with an additional 44 percent between the ages of 45 and 64. Older patients are more likely to have co-morbidities that eliminate transplant as a treatment option. Once a patient is diagnosed with ESRD, he or she will require either a kidney transplant or dialysis to continue living. The most common method of dialysis is hemodialysis. Patients undergoing hemodialysis treatment typically visit an outpatient clinic three times per week and undergo treatments lasting approximately four hours. During treatment, the patient is intravenously connected to a dialyzer which effectively cleans the blood through a complex process. In addition, patients with kidney failure often have anemia and receive erythropoietin (EPO) supplements during the treatment process. Patients who are not ambulatory, such as those who are in hospitals for other treatment or in nursing homes, can receive hemodialysis on an inpatient basis. Peritoneal dialysis is a possibility for healthier patients. Patients undergoing peritoneal dialysis do not need to visit clinics on a recurring basis. Instead, a tube is connected to the abdominal cavity (the peritoneum) and a sterile solution is inserted. This sterile solution absorbs waste products and is drained and replaced with fresh solution four to five times per day. In 2015, 79 percent of DaVita’s kidney care revenue was associated with outpatient hemodialysis treatments. 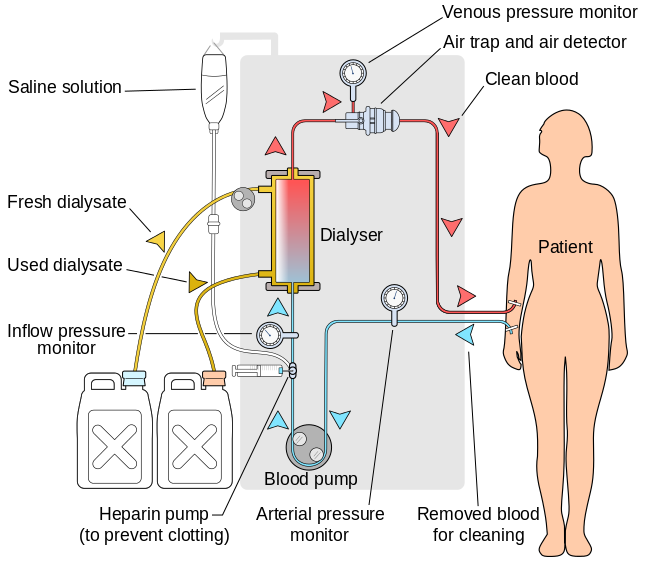 The following graphic, shared from Wikipedia, shows the hemodialysis process at a high level so readers can understand what takes place during the outpatient procedures DaVita provides. The statistics associated with kidney disease, ESRD, and diabetes unfortunately reinforce the impression that dialysis will be a growth industry in the United States for a long time to come unless breakthrough treatments or transplant options are discovered. For further reading on kidney failure, readers are encouraged to refer to the websites of the National Kidney Foundation, the American Kidney Fund, and the Centers for Disease Control and Prevention. As we have discussed, dialysis is a non-discretionary procedure required on a recurring basis to keep patients suffering from ESRD alive, barring a successful kidney transplant. During the 1960s, the use of dialysis became more widespread in the United States along with other advances in the field of kidney care. In 1972, the federal government decided to expand Medicare to cover dialysis for ESRD patients regardless of age. ESRD became the only disease state that could trigger Medicare eligibility for those under the age of 65. It is also worth noting that those who qualify based on ESRD status are entitled to all Medicare benefits, not just benefits related to payment for dialysis. ESRD patients receiving dialysis services become eligible for primary Medicare coverage at various times, depending on their age or disability status, as well as whether they are covered by a commercial insurance plan. Generally, for a patient not covered by a commercial insurance plan, Medicare becomes the primary payor for ESRD patients receiving dialysis services either immediately or after a three-month waiting period. For a patient covered by a commercial insurance plan, Medicare generally becomes the primary payor after 33 months, which includes the three-month waiting period, or earlier if the patient’s commercial insurance plan coverage terminates. When Medicare becomes the primary payor, the payment rates we receive for that patient shift from the commercial insurance plan rates to Medicare payment rates, which are significantly lower than commercial insurance rates. Medicare pays 80% of the amount set by the Medicare system for each covered dialysis treatment. The patient is responsible for the remaining 20%. In most cases, a secondary payor, such as Medicare supplemental insurance, a state Medicaid program or a commercial health plan, covers all or part of these balances. Some patients who do not qualify for Medicaid, but otherwise cannot afford secondary insurance, can apply for premium payment assistance from charitable organizations through a program offered by the American Kidney Fund. Approximately 90 percent of DaVita’s patients, and likely a similar percentage for the industry overall, is funded by government payors but payments from government account for only 60-70 percent of revenues and are insufficient to cover costs resulting in operating losses. Patients covered by commercial insurance are the source of all industry profits. The payment dynamics raise obvious issues related to patient mix. Overall profitability will be higher if the ratio of commercial to government coverage increases and lower if the ratio decreases. Typically, patients who are not already on Medicare will be covered by commercial policies for a period of time, up to 33 months, before Medicare kicks in. At that time, a dialysis provider will have to reduce the per-treatment cost from commercial levels to the levels set by Medicare. From the figures shown above, it is obvious that commercial rates are at least three times as high as the government rate. From a planning perspective, however, it does not appear that DaVita has to deal with much variability in payor mix. The exhibit below shows the breakdown between government and commercial payors over the past ten years. In 2015, DaVita provided nearly 26 million treatments earning average revenue of $348 per treatment. Patient care costs on a per-treatment basis was $221 in 2015 providing a margin of $127 per treatment. One additional item worth noting is that Medicare transitioned to a single “bundled” payment rate system on January 1, 2011 that is meant to encompass all of the services ESRD patients receive during treatment, including drugs and supplements that are delivered concurrently with dialysis. Prior to 2011, Medicare paid for drugs and supplements, such as EPO, separately. This change was meant to reduce incentives for providers to overuse or waste medications and bill Medicare for inefficient practices. In 2015, DaVita agreed to pay $450 million to resolve a lawsuit related to these alleged practices in its clinics prior to the implementation of the bundled rate system. 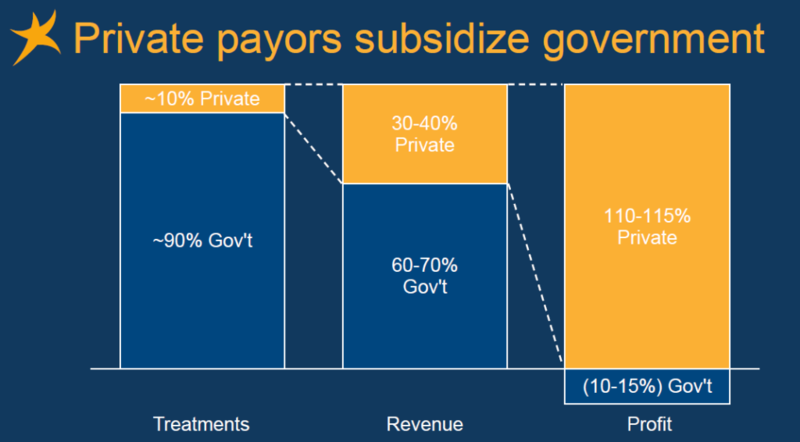 Although we will have more to say on the risks later, readers should note the peculiar nature of the industry’s revenue mix and the incentives created by having a large percentage of the population of patients producing operating losses for each treatment. Also, it is worth noting that scale is critically important in an industry where the major government payor has implemented a rate that is insufficient to cover the variable costs of providing treatment. 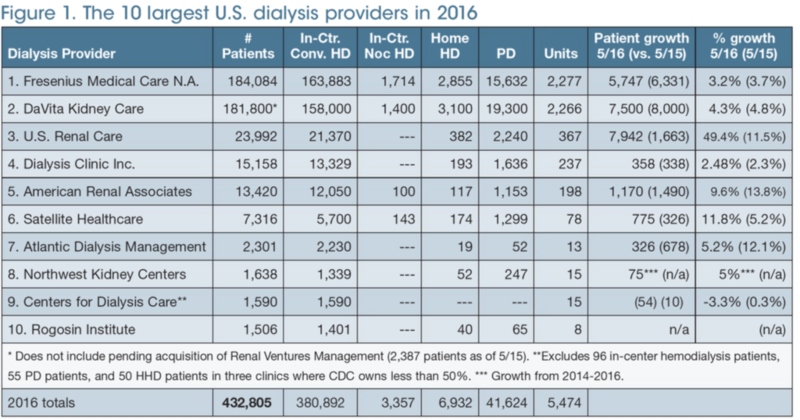 DaVita and Fresenius have massive scale compared to the rest of the top ten dialysis providers. The nature of the industry tends to lean heavily toward oligopoly. Prior to 2012, DaVita was essentially a pure-play provider of dialysis services and the kidney care business is still its most important and profitable segment. As discussed previously, approximately 66 percent of segment revenues are from government sources (Medicare, Medicaid, and other government programs) with the rest from commercial payors. The results shown above show somewhat more variation in terms of operating margin than is reflective of ongoing economics. In 2013, the company recorded a $397 million accrual to settle a lawsuit alleging a kick-back scheme related to physician referrals. This lawsuit was settled for $389 million in 2014. In 2015, the company recorded a $495 million charge related to a private civil whistle blower suit alleging that the company purposely wasted supplies in order to increase revenues from the Medicare system. Assuming that such charges are non-recurring, it appears that the underlying economics of the business produces operating margins in the 19-20 percent range and this is the level of operating profit that the segment has generated so far in 2016. According to a recent company presentation, the U.S. dialysis population has been increasing at a 3.8 percent annual rate since the turn of the century. Revenue growth has been obtained both through this organic growth in the addressable market and by expanding the number of dialysis centers through acquisition and development of new locations. The exhibit below shows the growth in centers over the past ten years. We can see that center growth has far outpaced growth in the number of dialysis patients. Management expects 2016 operating income for the kidney care segment to come in between $1.675 and $1.725 billion. Our overall assessment of this business is positive provided that the legal settlements reflected in 2013 and 2015 results are truly “non-recurring” in nature. There is cause for some concern that there will be future legal settlements on the horizon. On August 18, the Centers for Medicare and Medicaid Services (CMS) sent a “request for information” to dialysis providers to determine whether providers were “steering” patients who are eligible for Medicare into commercial plans in order to obtain higher reimbursement rates for services. As we have seen, there are plenty of incentives to steer patients in the direction of commercial plans. Although nothing has been alleged specific to DaVita at this point, the prospect of future action cannot be ignored given the company’s prior track record of settling lawsuits related to alleged misconduct. The 2012 acquisition of HCP brought an entirely different line of business under the DaVita corporate umbrella. HCP is described in the 10-K as a “patient and physician-focused integrated healthcare delivery and management company with over two decades of experience providing coordinated, outcomes-based medical care in a cost-effective manner.” This is a longer way of saying that HCP is in the business of providing managed care to its patients who are also referred to as “members”. At the end of 2015, HCP had approximately 807,400 members located in California, Colorado, Florida, Nevada, New Mexico, and Arizona. 317,400 members were enrolled in Medicare Advantage plans with the remainder enrolled in employer or individually acquired commercial health insurance or via eligibility for Medicaid benefits. While the company’s kidney care segment provides a very focused service to a relatively sick patient population, HCP is in the business of providing general healthcare services to a more diverse patient base. 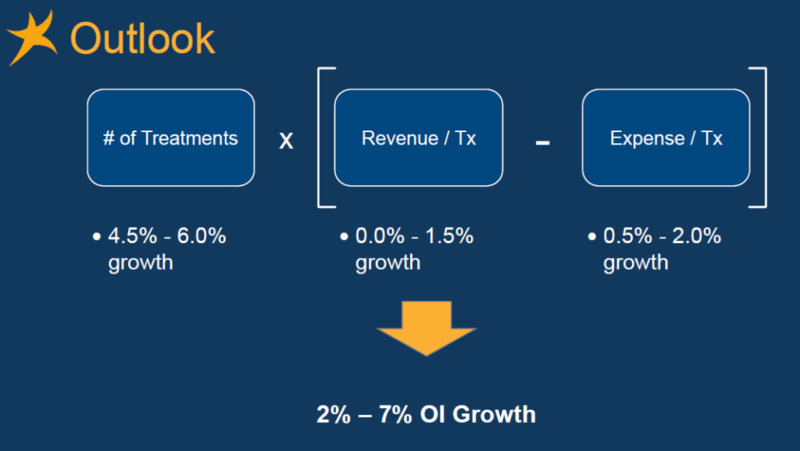 The majority of revenues are earned on a “capitated” basis which means that the company receives a set amount per member. Therefore, there are significant incentives to operate in a cost effective manner focusing on keeping members healthy over time. The HCP acquisition was completed on November 1, 2012 so the results shown above include less than four years of data. Total consideration paid was approximately $4.7 billion consisting of $3.64 billion in cash and 9,380,312 shares of common stock worth $1.06 billion (DaVita shares subsequently split 2-for-1 in 2013). In 2011, HCP generated $2.4 billion in annual revenues and $488 million in operating income. As we can see from the segment summary above, the reported results of HCP went downhill shortly after the acquisition. The depressed operating result for 2015 was partly due to a $206 million goodwill impairment but even excluding the effects of the impairment, operating margins are far below the levels seen prior to the acquisition. During the first half of 2016, additional impairment charges totaling $253 million were recorded which led to the operating loss for the segment. In addition to goodwill impairments, the segment records periodic non-cash amortization costs associated with trademark intangibles. DaVita has recently re-branded the HCP business as DaVita Medical Care and has forecast continued headwinds for the business with adjusted operating income of $130 million for 2016. Overall, it is difficult to regard the acquisition of HCP as a success at this point. Although DaVita and Fresenius have relatively comparable market shares in the United States, Fresenius has a much larger presence internationally. According to a presentation (see slides 41-45) posted on the Value Seeker investment blog, DaVita previously attempted to expand internationally during the 1990s and had to curtail that activity due to significant losses. The company is attempting to be more deliberative with international expansion. Although the economics of the industry varies widely from country to country, the fact that DaVita has little presence points to the opportunity for future growth. We would regard the company’s loss generating expansion activities to be akin to an “investment” in the establishment of a future international dialysis reporting segment. However, it is difficult to judge the potential return on these “investments” at the present time. DaVita has an established position in an industry that provides critical services to patients who have no choice but to continue treatment if they intent to continue living. The industry has characteristics that reward players that achieve larger scale and has evolved into an oligopoly over time. These are the type of characteristics that often lead to enduring moats. However, in the case of DaVita, there are significant risks associated with company-specific factors as well as the overall dialysis industry that investors must carefully consider. First, as noted above, in 2012 DaVita’s management allocated $4.7 billion to purchase HCP. Up to this point, the acquisition has not worked out as anticipated. This has been acknowledged by management quite candidly during conference calls and the goodwill write-downs reflect the poor results. DaVita could have instead repurchased shares, retired debt, accelerated its international dialysis expansion, or invested in new technologies related to kidney care. Although hindsight is 20/20 and CEO Kent Thiry has an excellent long term track record, we must regard recent this capital allocation misstep as a warning sign. Second, DaVita incurred large costs associated with settling two lawsuits, as we described previously. These lawsuits were related to alleged kick-backs to doctors and wasteful practices designed to over-bill Medicare. There are perfectly valid reasons for a company to settle a lawsuit even if the allegations are unfounded or could not be proven in protracted litigation. However, it is not entirely clear that litigation costs should be viewed as “non-recurring” in nature. We would point to the recent CMS “request for information” regarding alleged “steering” of dialysis customers away from Medicare and into commercial plans as a potential litigation risk over the next few years. Perhaps more troubling, all of these cases point to potential issues with the company’s culture. Due to the dialysis industry’s structure, providers do have a major incentive to steer patients away from Medicare since each Medicare patient results in operating losses. Management must be vigilant to ensure that incentive systems are not rewarding employees at any level for unethical or illegal behavior stemming from powerful incentives inherent in the industry’s structure. Third, DaVita’s dialysis business could be harmed by new medical advances that provide alternatives to dialysis. Currently, a kidney transplant is the only viable alternative to dialysis. However, researchers have been working on technologies such as growing kidneys from stem cells that could dramatically increase the number of available kidneys for transplant. There have also been advances in artificial kidneys that could either be worn or implanted in patients. It is not likely that any of these innovations will reduce demand for outpatient dialysis services over the next several years. However, it is safe to say that a significant number of hemodialysis patients would jump at the opportunity to explore options that do not involve traveling to a clinic three times per week and spending four hours hooked up to a dialysis machine. One wonders whether DaVita would have been better off directing the $4.7 billion spent for the HCP business toward R&D activities that could hedge against obsolescence of the hemodialysis business in the very long run (several decades). Finally, any business that relies on government for a significant portion of its revenue should be regarded as politically risky. It is true that the government is very unlikely to do anything that would endanger the viability of a private business that offers services necessary to keep Medicare beneficiaries alive. The political costs would be too high. The government is also unlikely to squeeze dialysis providers to the point where they close a large number of clinics because Medicare patients would then complain to their representatives regarding longer travel times for treatment. It is safe to say that government will push as hard as possible, however. Furthermore, one must also consider the possibility of a single-payer system eventually replacing the current mix of government and commercially funded health care in the United States. It is unclear how DaVita’s business would be impacted, other than to state the obvious that a single-payer reimbursement rate could not be below operating costs if the government wants to see private dialysis providers remain in business. Prior to discussing the company’s current valuation, let’s take a look at some consolidated data. The exhibit below continues the segment presentation provided earlier and reconciles segment operating margin with consolidated income before income taxes for the past five years. The main reconciliation item involves interest and refinancing costs associated with the company’s significant debt load. As of June 30, 2016, DaVita had approximately $9.1 billion in long term debt. If we consider the litigation settlements in 2013 and 2015 to be truly non-recurring in nature, we could adjust for those settlements in the consolidated figures as well. We can assume that a portion of the capital expenditures recorded each year are for growth initiatives, particularly when we cross reference this table with the earlier table showing the number of new dialysis centers developed each year. However, in the interests of conservatism, the free cash flow calculation simply takes cash flows from operating activities and deducts all capital expenditures without attempting to distinguish between maintenance and growth capex. As we can see, DaVita generates a substantial amount of cash flow which regularly exceeds net income. Since 2011, we can see that DaVita has used $6.5 billion for acquisitions and $1.1 billion for share repurchases. The HCP acquisition accounts for a majority of cash used for acquisitions over this period. The company has taken on significant debt to fund its activities in recent years as free cash flow has fallen short of capital allocated. DaVita currently has a market capitalization of approximately $13.2 billion based on shares outstanding as of June 30, 2016 and a stock price of $64.34 as of October 4, 2016. Enterprise value is approximately $21 billion given the $9.1 billion in debt and $1.3 billion in cash and cash equivalents on the balance sheet as of June 30. Given the persistent gap between reported net income and free cash flow, looking at the free cash flow yield seems to be more appropriate than focusing on the earnings yield (or the price-to-earnings ratio). This is particularly true if we believe that net income has been depressed recently due to the HCP goodwill impairments. In the second quarter conference call, management indicated that they expect 2016 operating cash flow of between $1.6 billion and $1.75 billion. If we assume that capital expenditures will continue at the run-rate of the first half, that would imply capital expenditures of approximately $700 million for the full year. Based on these figures, it seems reasonable to expect free cash flow of $900 million to $1,050 million for 2016. This would imply a current free cash flow yield of approximately 7.4 percent if we take the midpoint of the cash flow estimate. A high single-digit free cash flow yield is not unattractive in the current market environment particularly considering the nature of DaVita’s business. However, it may not fully account for the risks discussed above. We should note that even though the listing has Warren Buffett’s name associated with the DaVita holdings, this position was actually initiated by Ted Weschler who manages approximately $9 billion of Berkshire’s equity portfolio. Viewed in that light, DaVita is a very significant holding. Mr. Weschler also owns 1.1 percent of DaVita personally or through family interests with a current market value of approximately $150 million. We note that the stock price of DaVita has fallen significantly since the end of the second quarter. Berkshire will report its holdings as of September 30 in a 13F filing in early November. Berkshire and DaVita entered into a standstill agreement in May 2013 that prevents Berkshire from owning more than 25 percent of DaVita. Berkshire owned approximately 18.6 percent of DaVita as of June 30. DaVita has many characteristics that Berkshire typically looks for in an acquisition and, even with a control premium, the company could be easily purchased for cash given Berkshire’s large cash balance and strong cash flow. The existence of a standstill agreement does not necessarily preclude negotiation of a friendly takeover. It will be interesting to see whether the DaVita position was increased during the third quarter based on the recent stock price decline. Disclosure: Individuals associated with The Rational Walk LLC do not own shares of DaVita.